San Miguel High School hosts the First Tech Challenge for the second year! Read more. 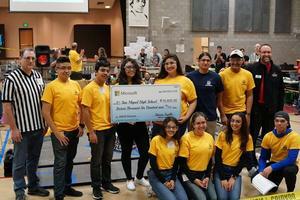 We hosted our second STEM tournament - the First Tech Challenge with our future engineers. On December 8th, we hosted 20 teams from New Mexico and Arizona! Thank you Microsoft for supporting this tournament and San Miguel. This is extra special because Adonis Trujillo (in navy shirt) graduated Class of 2009 and is now working at Microsoft! Full circle, he came back and made this partnership happen for current students. Thank you to board members, community volunteers, staff, and students who made this possible!